The Heppner flood of 1903 was a tragedy that took place in the little Eastern Oregon town that I was born and partially raised in. In one July afternoon, a flash flood took out a third of the town's structures and killed a quarter of the population. It's still the most tragic natural disaster on record in Oregon and the second deadliest flash flood in the whole US. The flood story is an intriguing part of the life of each person who has ever had a heart connection with Heppner. As a child, I spent countless hours perusing the exhibits at the Heppner Museum---a place that seemed so spooky to the young me, mainly because of the flood history to be found there. A "permanent" solution to the town's flood problem, the Willow Creek Dam, was built when I was four and we moved to a house about 350 ft. from the base of it when I was in the first grade. I still remember my mom freaking me right out by talking with my dad about her fears of the dam breaking and how we'd never have a chance to make it up Cross Hill to safety. No, no we wouldn't. Not from 350 ft away. As an adult, I had the opportunity to serve as editor of the Heppner Gazette-Times, my last "outside the house" job before coming home to be with my family full time. For a short time, I ran a feature on Heppner's history and spent a lot of time going through the old Gazette articles about the period of rebuilding the town. It's always fascinated me. Several years ago, I was approached by a lady who had seen my family at church and wondered if I might assist her with a project she was working on. When we met at a park later that week, she shared with me her interest in the history of the Heppner flood and a bit about the novel she was working on. She said two of my children would be perfect models for the children in her story and asked if I'd mind doing some photos of them for possible use on her novel's cover. Since my writing project at the time was also set in Heppner during the days after the flood, I figured God probably brought Peg Willis and I together as friends for a good reason. Three years later, it's wonderful to see her dream in print. Having my kids on the cover is a great thing too, but the real blessing comes from seeing my friend leaving a legacy and putting some faces and souls to the tragedy of the Heppner flood. Rise Above is the fictional story of the flood and the days, weeks, and years afterward. Peg has created an engaging tale of the missing Lilyann and Gilbert Harmon, their father Mac, the dead and surviving victims of the Heppner flood, and the impact it likely made on communities much further out than little Morrow County, Oregon. I love books that teach and Rise Above is exactly that. Peg is a natural educator and historian so you know she's got her facts right. I loved seeing the old photos from all over the Pacific Northwest and imagining how these places I know so well would have been a little over a century ago. I'll be honest--- there were several inconsistencies, coincidences, and easy-fixes, that made the fictional part unbelievable in lots of places---but the history was right on and any book that makes me cry three times is a good read. I've read several nonfiction books on Heppner's history and know the modern day streets, hills, buildings, creeks, and canyons like I know my own heart. They're a part of me and five generations of my family---most of whom still live there. This is the first time I've seen anything on the Heppner flood in story form and, with the community as my history and my children (in my mind, at least) as the main characters---well, I'm the only person in the whole wide world who will get to experience Peg's story in that unique way! 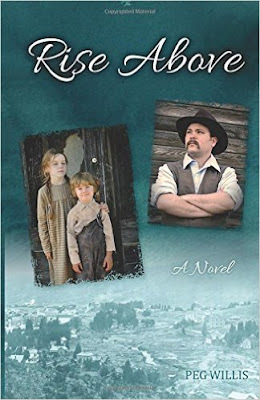 With Rise Above, Peg has given a beautiful gift to the people of Heppner---all six or seven generations who have already been impacted by the disaster---as well as anyone who enjoys a good, clean, historical read with a happy ending. For more from Peg Willis, check out: Building the Columbia River Highway: They Said It Couldn't Be Done. I just finished reading "Rise Above," by Peg Willis. Peg is a Northwest history writer who lives in my neighborhood. This fictional story based on the true history of the 1903 Heppner, Oregon flood perked my interest from the first time I heard of it. I was born and raised in Heppner. My first home as a newborn sat on the land next to the courthouse where the temporary tents were set up for the homeless after the flood. I have lived in numerous houses in Heppner, Lexington and Ione and played in the same creeks as a child. I have family all over Heppner and still visit there quite often. I had a hard time with the first few chapters of this book. It was probably due to the horrific devastation which needed to be told. Also, two of my grandchildren were the models for the front cover, but once I got past my own personal memories of the two floods I experienced in my home town before the dam was built, I was able to settle down and enjoy this exceptional novel. This is a bittersweet tale of grief and an excellent example of how God can give us the strength we need to move forward during the hard trials in our lives. I loved how everything just fell into place for Lillyann, Gilbert, Grace and the others. I would recommend this book for anyone whether or not they are familiar with the history of Morrow County's historic flood. Full House Reading Challenge for "Published in 2015"
Social historian Daniel Pool first caught my attention last year when I read his earlier book, What Jane Austen Ate and Charles Dickens Knew: From Fox Hunting to Whist-the Facts of Daily Life in Nineteenth-Century England. It is a great reading companion and resource for all the major 19th century stuff that intrigues. In Dickens' Fur Coat and Charlotte's Unanswered Letters, Pool gives an excellent cultural history focusing on major (and some minor) authors during the Victorian period in England. More than just a book of trivia, this is an in-depth look at how some of our favorite classic authors came into and functioned within England's literary world. I'll admit---there was a lot of new information for me in this one---which is what made it such a great read! Some of the best takeaways were actually things I could have gone without knowing. For instance, I have a developing loathing for Charles Dickens after learning a bit about his personal life---a disappointment, for sure, since I was so positive we would have been groupies should I have been writing a couple centuries ago. Once I get round to reading his biography later this year, I'm sure I'll completely despise him. 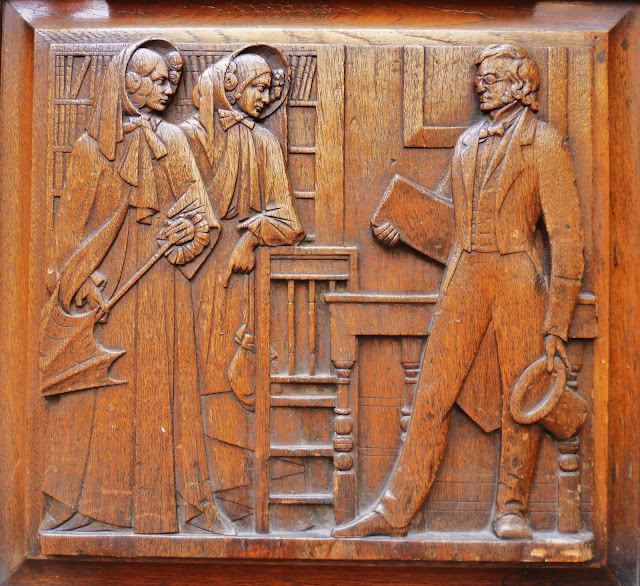 I also couldn't help feeling bad for poor Arthur Bell Nichols, the husband of Charlotte Bronte. From finding out his wife agreed to marriage as a last resort, to having his personal life plastered across the pages of a best seller, to being lied to and cheated by money-hungry thieves, the poor guy just couldn't catch a break. one of 8 wooden door panels at 3, Cornhill, London. 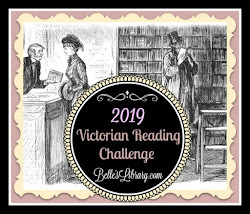 Still, it was definitely enjoyable and I've managed to add several new books and authors to my Victorian reading list. It's horrible, but I think I would have been one of those "sensation novel" readers---and authors too, probably. Full House Reading Challenge for "Thought Provoking Book"